August was an average of 0.81°C above the 1951-1980 mean and is the second hottest August on record, after August last year (0.82°C). June and July this year were the hottest June and July on record, respectively. The highest anomaly this year is now March at 0.91°C, which makes it the second hottest March after March 2010, at 0.93°C and equal with March 2002. 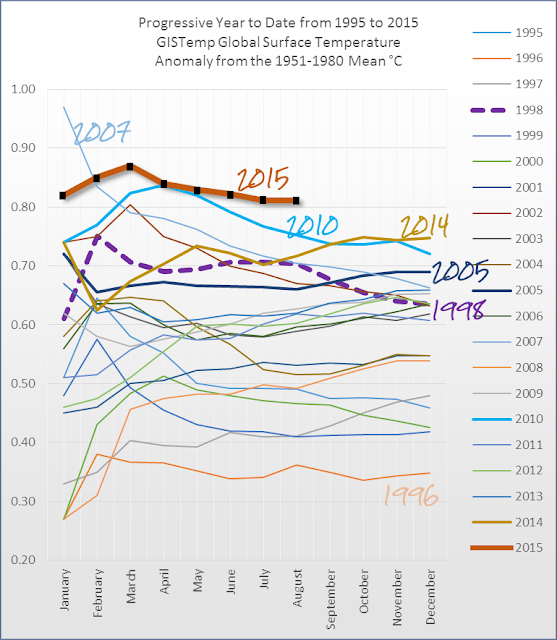 2015 is still hottest on record so far, and not showing any sign of dropping. The lowest anomalies this year so far were April, now 0.75°C, and July also 0.75°C above the 1951-1980 mean. The progressive year to date average up to and including August is 0.81°C above the 1951-1980 mean. According to a UK Met Office release yesterday, "big changes" are underway. "The latest climate predictions and global observations suggest that shifts in key global climate patterns, the Pacific Decadal Oscillation (PDO), an El Niño in the tropical Pacific and the Atlantic Multi-decadal Oscillation (AMO) are underway. They are implicated in the weak Indian monsoon and relatively inactive Atlantic hurricane season this year and will affect regional temperature and rainfall worldwide in coming years. They also affect global temperature; with a warming influence from El Nino and positive PDO, and a cooling from a negative AMO." "These changes suggest both 2015 and 2016 are likely to be very warm globally. Earth’s average surface temperature is running at or near record levels so far in 2015 at 0.38±0.14°C* above the 1981-2010 average (0.68±0.14 °C above the 1961-1990 average)"
Meanwhile, in theregister, Lewis Page manages to mention that Hurricanes are lessening in the Atlantic without mentioning the El Nino, or the PDO. What kind of chem trail toting wipe is that 'the register'? Lewis Page is the resident equivalent of James Delingpole at The Register. He nurtures a small group of commentards that agree with his distortions of the science. "BTW if anyone wants to put together other ways of illustrating this, eg by maps or other means..." Sou's last comment last month on 'YTD including July', regarding reaching a graphically challenged audience. 1.....An obvious corollary would be to make graphs easier to read. Which might start by presenting readers with one they've seen before, by plagiarizing the omnipresent 1880-2014 GISTemp "Global Land-Ocean Temperature Index" (LOTI) graph (with its 5-year running mean) whenever possible. 2.....Then an obvious way to use the global temperature maps might be to locate two of them to the right of the above graph with arrows to their respective readings, for ~1970 and ~2014. 3.....If the y-axis is extended up to ~1.0, the Hot Whopper YTD graph will fit above the LOTI curve. Only the hottest years should be individually color coded: 1998, 2005, 2010 & 2014. The rest of the above individually-uninteresting 'pause year' spaghetti would be the same color. Which will be repeated in the LOTI's 1998-2013 'year-squares and their interconnecting lines. Thus forming a tamino (22Jul & 30Jul) denial-time box. That there is the recent Lewandowsky, Risbey & Oreskes, 2015 [The 'Pause' in Global Warming: Turning a Routine Fluctuation into a Problem for Science.] is an indication that this killer graphical depiction of tamino's denial-time box would have continuing usefulness.